The average person may not experience heartburn as often as pregnant women and older adults, but it’s still one of the most common digestive complaints. A random bout of heartburn can usually be linked to something specific, such as a large meal, a spicy dish or too much caffeine. Frequent heartburn, which is the primary symptom of acid reflux, can often appear to be triggered by just about any food or beverage, including water, although water doesn't often cause a problem. 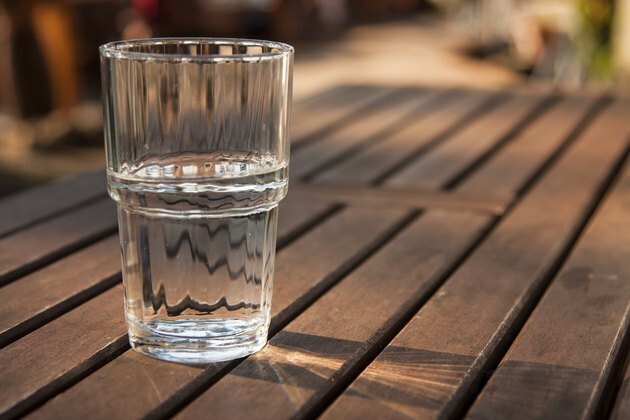 Most people who are affected by recurrent heartburn generally find water easy to tolerate, and may even drink some to help ease symptoms when it occurs. The University of Maryland Medical Center suggests that drinking filtered water throughout the day -- while following other dietary recommendations aimed at controlling acid reflux -- may help prevent heartburn. While you’re far more likely to get heartburn from citrus juice, whole milk, decaffeinated coffee, regular coffee and other caffeinated beverages, carbonated drinks and alcohol, water can provoke heartburn in those who are more susceptible to acid reflux. The act of swallowing water, rather than the water itself, can lead to heartburn, particularly if you guzzle it or take big gulps. Even if it doesn’t make you belch, swallowing air along with your water can irritate the ring-shaped muscle that separates your esophagus from your stomach and cause it to relax, allowing acid to escape into your throat. The act of swallowing water may trigger heartburn in another way, too. A study published in "Diseases of the Esophagus" in June 2014 found that acid reflux was common in people whose esophageal muscles didn’t contract and relax properly when swallowing water multiple times. Before you blame water for your next encounter with heartburn, consider the other factors that may be contributing to your problem. If you’re prone to acid reflux, lying down after drinking a glass of water, even on an otherwise empty stomach, can lead to heartburn. Because vigorous activity can stress your digestive system, drinking water before or during a workout may trigger heartburn. High levels of stress are also known to provoke acid reflux, which is why water may appear to give you heartburn when you have consumed little else but are stressed or anxious. Smoking and being overweight can be major factors in recurrent heartburn as well. Water is more likely to cause heartburn in those who are significantly affected by acid reflux. If the lining of your esophagus becomes so inflamed that even water is irritating, you should consult your physician. Chronic heartburn is not only uncomfortable, it also increases your risk of developing esophageal cancer if it’s left untreated. You can probably manage your reflux and control your heartburn through dietary and lifestyle changes and antacids. If those doesn’t provide relief, a gastroenterologist can look for any underlying problems. Hiatal hernias are a fairly common cause of reflux, and usually require surgery.